A good laugh is better than a trip to the Dentist. ← Latest cartoon. Improving the Manufacturing Industries production. Latest cartoon. Solving one problem can create another. Problems and how to solve them. 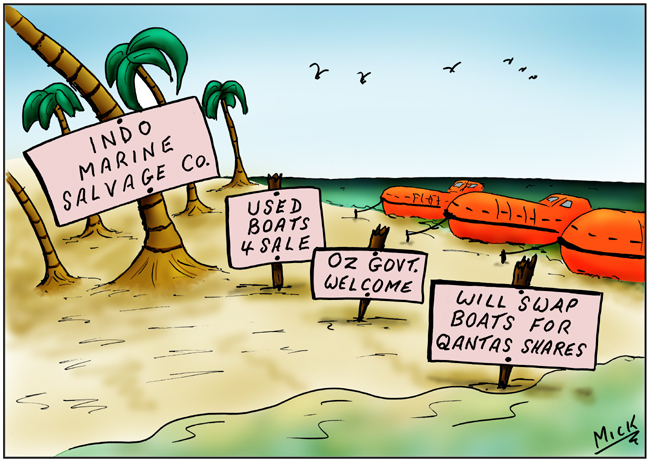 Posted on February 27, 2014, in Cartoon, illustration, humour, humor, caricature, political, art, Australia, Perth, cartoonist, Illustrator and tagged asylum, Australia, boats, Cartoon, cartoonist, humour, Perth, Political, Qantas. Bookmark the permalink. 2 Comments. Nice to see you back and in form Mick. Thanks, always good to keep the mind ticking over. Privatising an apple a day. Sanity – buckled and wrecked by politics. It’s your fault (yes, you). Elections campaigns come and go. Born to Rule (from the pedestal). Has the Captain made his last call? Is it too late to change for Climate Change? Increasing droughts – Water shortages call for drastic measures. Metadata – Can we retain the memory of this fiasco for two years ? Climate Change? Nothing to worry about !! Energy cartoon – Is the Government really encouraging development and promotion of Solar Power? Carbon Tax cartoon – Will anything else be effected by axing the carbon tax? Latest Cartoon – What’s happening? Latest cartoon – Is the budget really going help those out of work? Latest cartoon. Decision time is ? – Soon – Now – Too late. Is there a Budget crisis or emergency? Old cartoon is still very applicable. Latest cartoon. Using our new found “locked up forests”. Latest cartoon. Improving the Manufacturing Industries production. And so it begins . . . .
A “sign”, please, give me a “sign”. Run, hide, it’s worse than you think …. PLEASE, NO RELATIVE SECRETS ! There’s a sponge in the pot ! THANK GOD FOR TAX !!! The G spot needs attention. Women laugh. Yes they do. TAKE IT OR LEAVE IT ?